Those affected by recent flooding are being warned to lookout for storm chasers and scammers. A number of professionals need to be licensed by the State. Below is a list of resources where consumers can search for licensed workers and learn more about agencies that can help with the clean-up. Twenty different agencies are on-hand to better direct and answer questions of those recovering from the storm. The center will be open Thursday and Friday from 10:00 AM to 8:00 PM, and on Saturday and Sunday from 10:00 AM to 5:00 PM. It's located at 9401 Frederick Road in Ellicott City, Md. All tree care professionals practicing in Maryland must have a license. To search for licensed tree experts, click here . The Maryland Home Improvement Commission licenses and regulates home improvement contractors and salespersons. It's important to hire someone that is license, insured, and bonded. Click here to check an individual or business is licensed. Flood insurance is not typically covered by homeowner's insurance policies. Coverage can be obtained through the National Flood Insurance Program (NFIP) . There are limitations on what is covered. Contents are not covered by a building/structure flood policy. To cover your belongings or contents within a building, you'll need to add contents coverage to your existing building/structure policy. There is typically a 30-day waiting period before flood insurance takes effect. $42 a month. Premiums will vary depending on your location and flood zone, the risk of loss in your area, the amount and type of coverage needed and the preferred deductible amount. The agency provides consumer protection by helping to resolve claim disputes and educating consumers on what types of coverage are available and at what cost. To see how the MIA can assist you, click here. The Maryland Department of Labor can assist with job search services, unemployment insurance, replacement licenses, and more. For a full list of services, click here . Due to the state of emergency, health insurance carriers have waived time restrictions on prescription medication refills and authorized payment to pharmacies that fill prescriptions for residents that live in the 21041, 21042, 21043, 21045, 21228 and 21229 zip codes. Patients can obtain a new supply of any prescription medication regardless of the date when it was most recently filled. Contact your insurance company for specifics on policy coverage and filing requirements. Do your research. Check that professionals are licensed and check the BBB for reviews. Resist high-pressure sales. 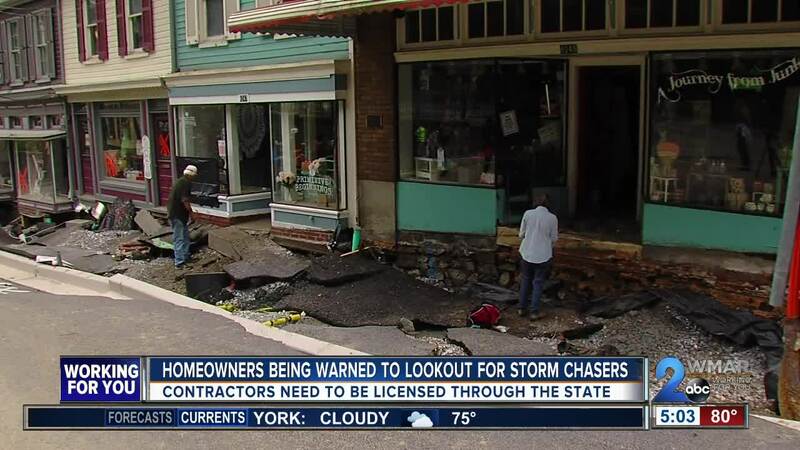 Some storm chasers use tactics such as the “good deal” you’ll get only if you hire the contractor on the spot. Be especially careful of door-to-door contractors. Ask for identification. Check that their business is legitimate.